that they are really chewing and shedding machines! Ensuring that co-existing with your furry companion stays pleasant for all is much easier if you do your homework before adopting that cute pup. Any experienced dog mom will tell you that it's not always a walk in the park, but taking the time to be informed before making the 10 yr + commitment, as well as arming yourself with the right supplies, can make all the difference in ensuring your experiences or more pleasant than troublesome! Grooming is no small part of the Pet Mom routine. Even with our short haired Lab, regular brushing is a must! Pet Groom Pro ~ a unique grooming brush with ionic technology, designed to remove shedding fur and odors from your pet's coat. With a removable Snap N' Clean Plate, cleaning up after grooming and disposing of fur is much easier than with traditional grooming brushes. The extra firm bristles are specifically designed to tackle thick undercoats, removing mats in the fur. Installing a battery allows the user to switch on the silent, ionic feature. Putting the Pet Groom Pro to the test on our short haired Lab, we were pleased with the results. Our boy seemed to enjoy the feel of the ball tipped bristles and the brush was quite effective at removing his shedding fur. As with all of our brushing experiences, fur does tend to go everywhere, but a significant amount was trapped and held in the Pet Groom Pro plate. Switching on the ionic feature did not produce a visible effect, however, I believe that is inherent in ionic technology as one cannot observe the effect of an ionic air cleaner, either. Overall, the Pet Groom Pro did a good job on my Lab of removing his shedding hair and stimulating his skin. I found it light weight and easy to use. The removable plate did make it easy to dispose of the fur, although I had some difficulty replacing the plate on the brush. Of course, my 10 yr old reattached it in mere seconds. My seasonal allergies preventing me from being able to discern whether or not it was effective in odor reduction. You can purchase the Pet Groom Pro at TVTopTen.com for $9.95, as well as view and purchase from the full line of As Seen On TV pet supplies. TVTopTen.com is generously offering That's What She Said readers a chance to win a Pet Groom Pro! * Tell me about your pets, what type, how you came to adopt them, a funny story about them... 1 entry. Congrats to Vicki S., comment #4, courtesy of Random.org! On behalf of TVTopTen and That's What She Said, thank you to all entrants for following and participating! I was provided with a Pet Groom Pro to explore for the purposes of creating this feature. The opinions above are both honest and my own. Images and information sourced from TVTopTen. Sponsor is responsible for supplying and shipping prize. 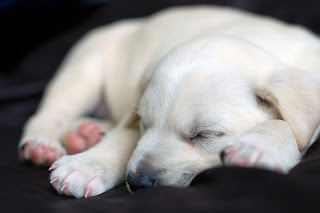 Puppy Image. Facebook is not associated with nor responsible for this giveaway in any fashion. gfc follower as "sswpss" & I'd love to try the Shed Ender b/c my cat sheds a lot! I have a wonderful 5 year old Golden Retriever, named Mazie. She is my best friend. We play hide n seek in the house or outside. I put her in a down - stay. Then I hide somewhere in the house - in a closet, behind a door, behind a chair, under a blanket, etc. I call 'come' and she has to find me. She loves this game and I do too. I'd love to try the Mouse Chaser Cat Toy! I have 5 cats and 2 dogs, a pomeranian and a husky/lab mix, and they were all rescues. We are constantly fighting the dog-and-cat-hair battle in our house! Even with regular brushing it's difficult to keep ahead of the shed. I'd love to try the Sticky Sheets...that would make it at least a little bit easier to stay in control of all that hair! I entered the Water-LESS Pet Bath Towels giveaway! Well I have a small zoo. I have 2 dogs, 4 cats, 3 hamsters, 2 scorpions, 4 lizards, 7 snakes and a rabbit. I can so use this for my fur babies. I'm a GFC follower :) The Crazy Critters look fun! I'd like to try the shed ender! I like the Water-LESS pet bath towels. I am owned by a long hair tuxedo cat named Gigi. She is a good alarm clock. If I try to sleep too long she climbs up on me and meows.